Chronic condition: Limit in the amount or kind of activities that one can do due to the presence of one or more chronic health conditions that have lasted or are expected to last six months or more and that have been diagnosed by a health professional. Developmental delay: Cognitive limitations due to the presence of a developmental disability or disorder, such as Down syndrome, autism or mental impairment caused by a lack of oxygen at birth. Hearing: Difficulty hearing what is being said in a conversation with one other person, in a conversation with three or more persons, or in a telephone conversation. Seeing: Difficulty seeing ordinary newsprint or clearly seeing someone’s face from 4 meters away (12 feet). Source: CICH graphic created using data adapted from Statistics Canada, Participation and Activity Limitation Survey, 2006. https://www.canada.ca/en/employment-social-development/programs/disability/arc/disability-2006.html#s3 – accessed May 29, 2017. 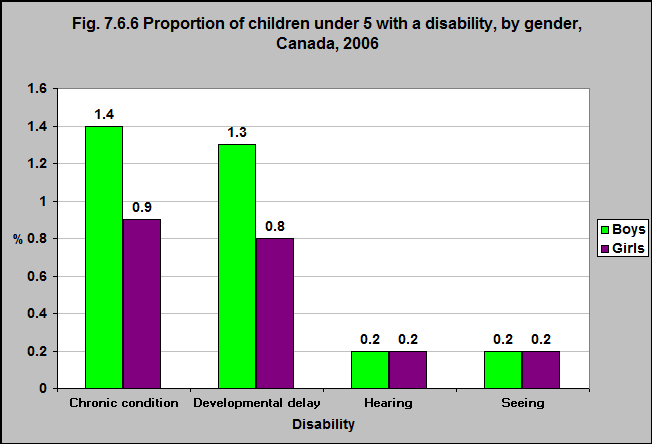 In 2006, 1.4% of boys and 0.9% of girls under 5 had a chronic condition. 1.3% of boys and 0.8% of girls had developmental delay. 1Statistics Canada, Participation and Activity Limitation Survey, 2006. http://www.statcan.gc.ca/pub/89-628-x/89-628-x2008009-eng.htm-accessed June 25, 2017.